Oreste Zevola, a cultured and refined artist, has lived and worked between the two capitals of his cultural imagination, Naples and Paris. If, during his career, Zevola has excelled in all forms of experimentation - from painting to sculpture, from design to comics - it is the graphic works he signs to illustrate the film Il resto di niente of Antonietta De Lillo who express the pinnacle of his art. 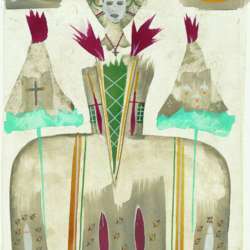 True paintings alive that combine the historical and magical dimension of existence, the drawings exhibited at the Institute represent maquillées queens, sirens on the branches of a small forest, seas of fish, floating skulls, amulets, volcanoes in flames. It is all the imagination of the Neapolitan culture, its excesses and its excess, that take shape. In the images of Zevola, revives the courage of the fighters of the Neapolitan revolution of Protected content , as it was told by Enzo Striano, author of the book that inspired De Lillo. In the presence of Alfredo Cafasso Vitale, curator of the exhibition, Marina Gargiulo, curator of the exhibition and president of the Archivio Oreste Zevola, Giusi Laurino, founder of La Fabbrica delle Arti, and Antonietta De Lillo. Until March Protected content to Friday from 10am to 1pm and from 3pm to 6pm, as well as in the evening during events). In collaboration with Associazione Archivio Oreste Zevola.